Eyelash routine! Ive been really into my eyelashes at the moments and have been asked loads if my lashes are my real lashes! I will reveal my secret to everyone! For the past couple of months i have been using Mac Prep + Prime Future Length Eyelash serum and it works wonders. I already had long eyelashes but the serum has made them longer, fuller and curlier. Bit expensive at £21 but it works so i dont mind spending it! After I let that sink in for about five minutes, i use an eyelash curler by Superdrug and curl my lashes at the root, then slowly move forward bit by bit, curling them as i move the eyelash curler. Then I apply 2 coats of black mascara. 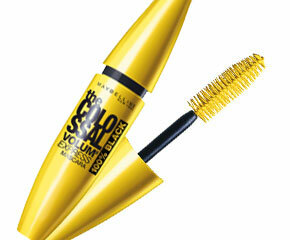 The one I use at the moment is the Maybelline Colossal 100% black or I use the one that came in the hat box by Fearne Cotton. I get the brush at the root and twist the brush as i apply the mascara. Then after all the lashes are coated i go back to the root of the lash and do zig-zag motions to seperate them. I repeate the process for the 2nd coat.